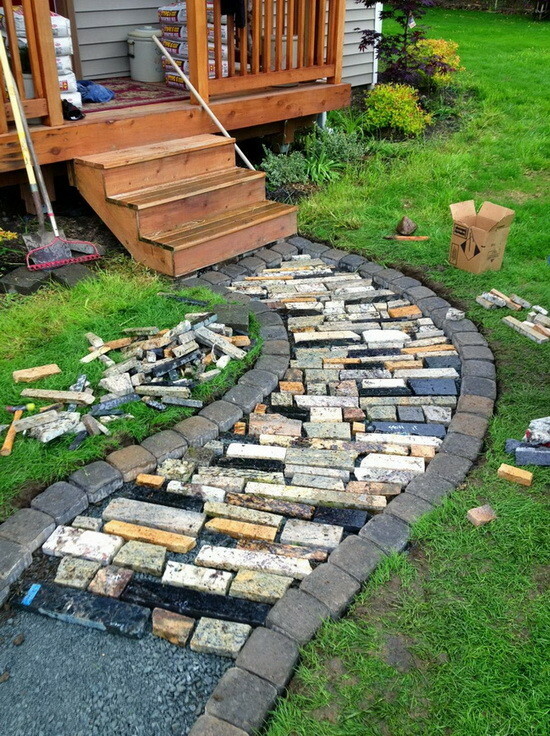 If you are looking for one of the most unique ways to make a walkway or pathway that leads to your front door, we may have it right here. Using granite that was leftover from a granite counter top company, we bought a truckload very cheap. 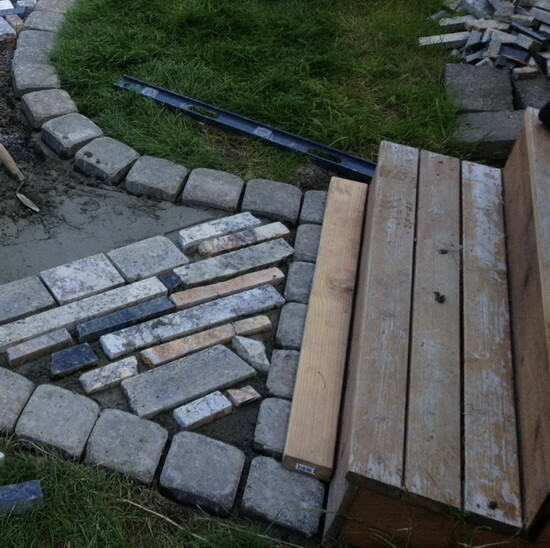 We decided to use it to make a great looking walkway using the recycled granite and common pavers. What did we use and where did we get it? 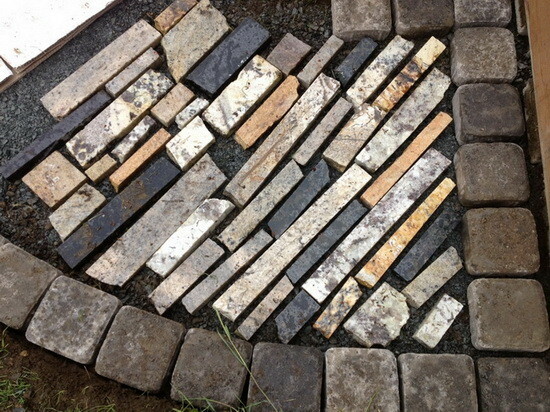 We purchased 3 pallets of big granite pieces and they were anywhere from 1″x2″ to 2’x3′. We had to sort through all of the granite to find the best pieces to use for our walkway. Now if you are wondering where you can get some granite pieces like the ones we used below, call a local granite counter top company or check Craigslist. Most granite counter top companies have to pay big money to dispose of the little pieces of granite they have no use for. You can take advantage of this by letting them know that you will take the next batch of “scrap” granite that they will be needing to dispose of. Most of the time they will give it to you free or charge you a small fee to take it. Either way there are so many different things that can be done with pieces of granite that even a small fee would be worth it. Note: If you will be cutting the granite yourself to make the pieces smaller, wear a dust mask. Granite contains zircon crystals, a constituent of which is uranium. A decay product of this uranium is radon gas which can lead to major lung problems. Also…. To avoid a slippery walkway, use smaller pieces of the granite. If you use larger pieces such as a sink cutout, it will be slick when it rains and you will fall. 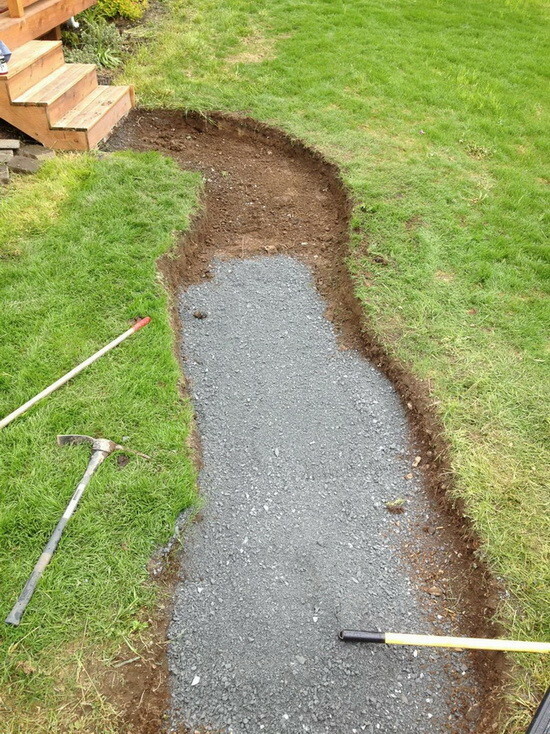 filling it with gravel and then making it nice and level. 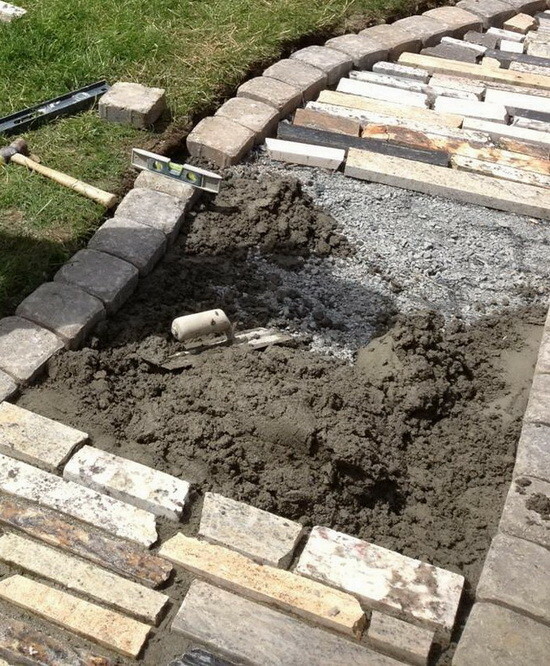 We laid out our pavers and laid out the granite pieces so each would have a place to fit. Then the mortar was put on top of the gravel and we started to set the granite into the mortar. each had to fit perfectly within the border of the pavers. Here is a closeup of how nice the granite actually looks when it is evenly put into the walkway. Here we are almost finished with adding all of the granite and just a little ways to go until complete. In this photo you can see that all of the granite is in place and set in the mortar. All we need to do now is seal the granite with grout. 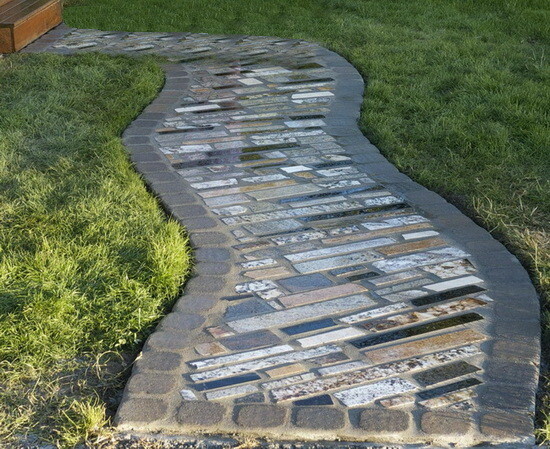 Here is the walkway completely finished and it has been fully grouted and sealed. 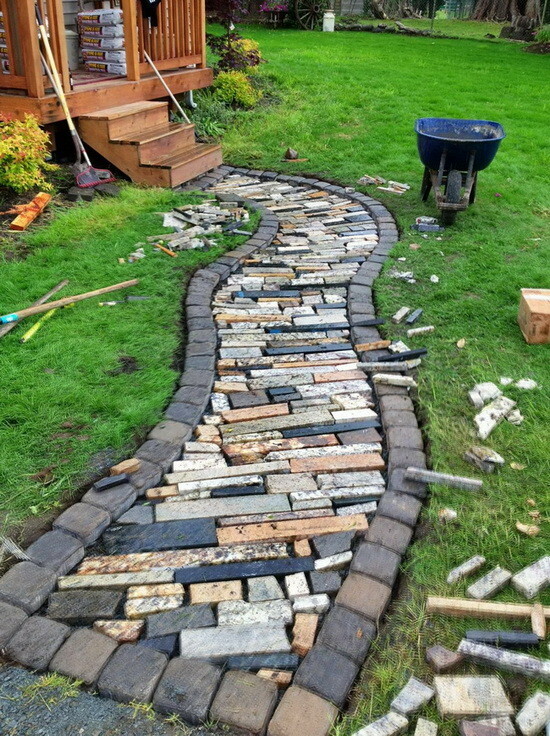 We have several pieces of granite wed like to do this with, but I’m worried about it being too slick if it rains. Would you recommend this project in a sand yard? What was your approximate total cost of the project after buying grout, the stone edges, and sealant? Are there specific brands/stores you could recommend?